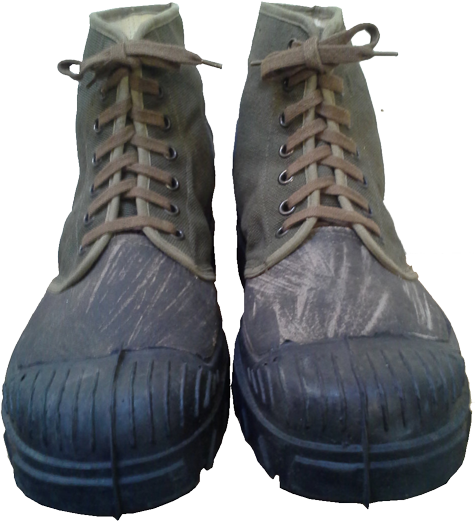 The boots by "Paraflac" recall the classic and the familiar "Converse"-type "keds"-like sneakers, they feature high and massive black rubber out-sole, which grasp the shanks almost like "galosh" rubbers, with an additional thickening at the inside shank of each boot, its own tread pattern and round protective rubber pads on the on the inner surfaces of top. 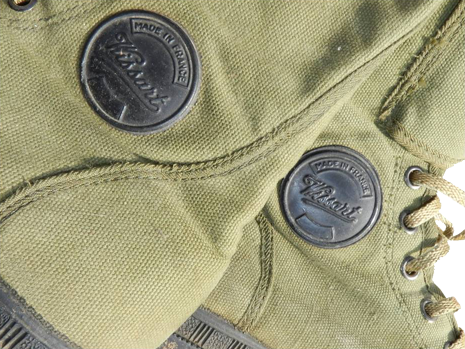 The number of lacing eyelets was different, for example, 5 or 7. The removable insoles were made of woven hemp. They year of production (e.g. 1957) was ink-stamped on the inside. 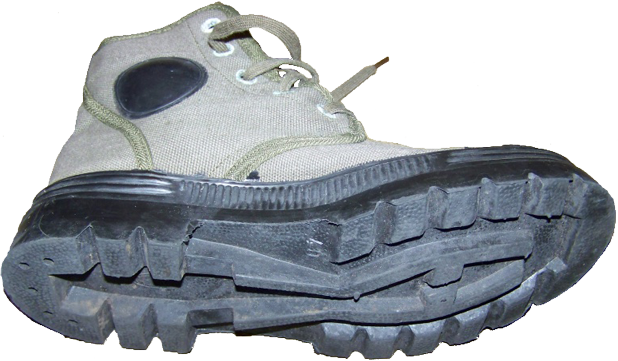 The sole had the indication of size and the manufacturer's name. At the top of the "Paraflac" boots, from the toes to the bottom of lacing, the rubberized waterproof tarp was used to protect this area from moisture impregnation. 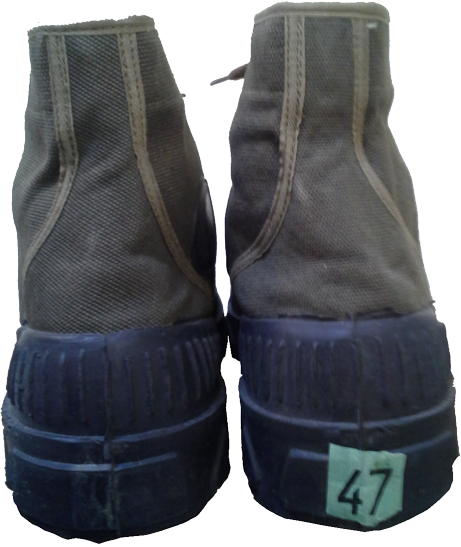 Obviously, this measure reduces the ventilation inside the boots, and it is not surprising that the other manufacturers have not rushed to follow this idea - it still not ensured any serious protection from external moisture, but it was difficult to dry the sodden canvas boots of such type. 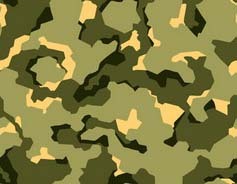 Nowadays one can find(relatively cheap, usually in French ebay) the original "Pataugas" on sale, in "mint" condition (mostly by production of "Vernon" or "Wissart"), but the vast majority of them are large sized, and the reason for that is very simple: only a very few soldiers had large size feet, plenty of bigger size boots have never been issued. 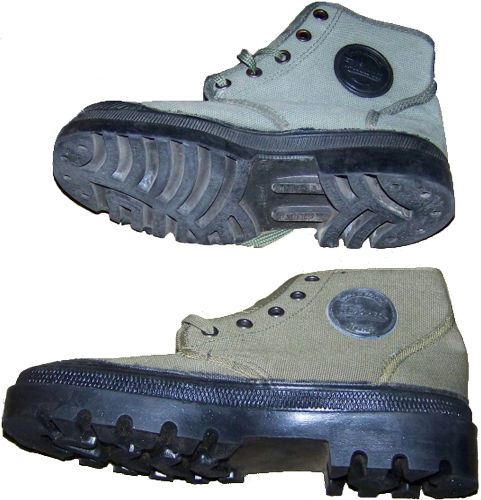 Medium and small size boots, on the contrary, were widely used, and such lightweight boots used to wear out very quickly in the field. 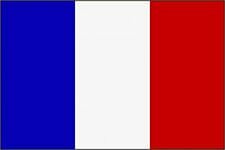 After about six months of use in the war time, for example, in Algeria, they began to fall apart, and that was the price for using those extremely lightweight and breathable boots. 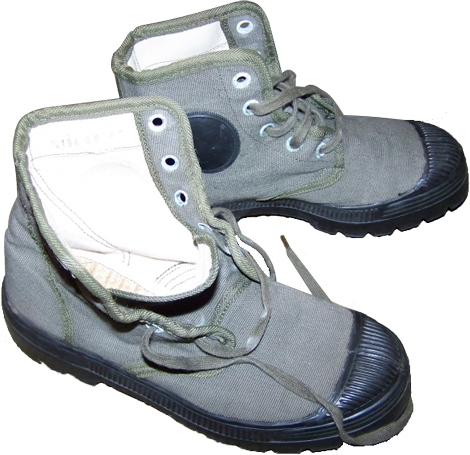 Canvas boots by "Vernon" were one of the first to appear, and this company took active part in the development and testing of prototypes of "chaussures de brousse". 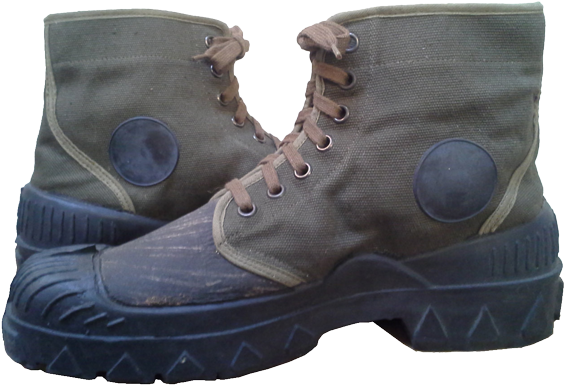 They do not differ radically from all the other canvas boots of the French armed forces, except for the design of the sole and the tread pattern: the edges of the soles feature the square-shaped lugs, in the center, starting from the heel and almost to the toes there are strong longitudinal lugs, and in the middle area of the out-sole there is a small ledge that makes the design more anatomically correct, and provides greater comfort when walking. 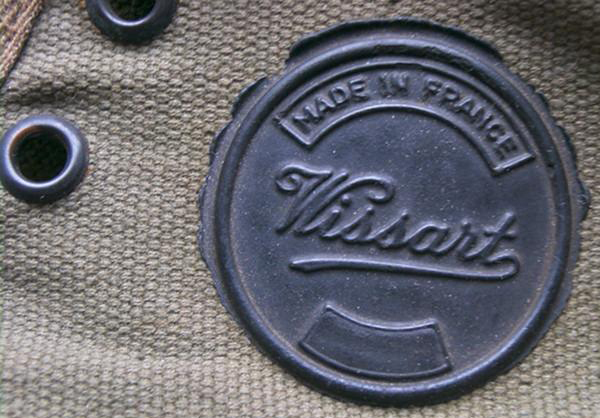 Among the currently marketed original "Pataugas" a significant part are made by "Wissart". 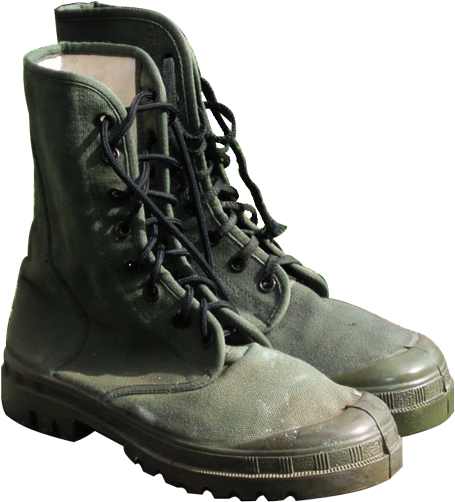 This manufacturer used to make all existing versions of these canvas boots - high and low, with the cuffs and two buckles and without them, with black and green rubber out-soles, with different number of lacing eyelets, with green canvas top of various shades, from olive to the one, similar to the standard US Army color of tropical uniforms (OG-107 Tropical Combat Uniform jungle fatigues), which was used from 1952 to 1989.